Thanks to NursingBraExpress.com for sponsoring the products for this giveaway. 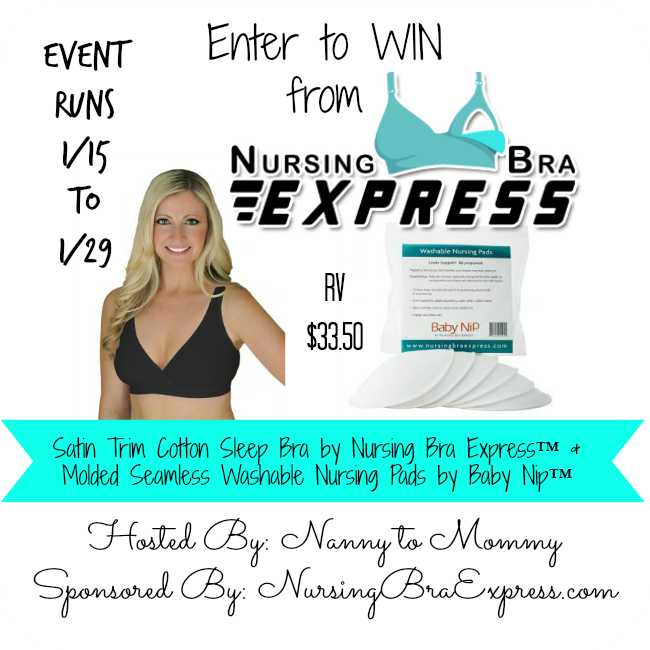 I am so excited to offer one very lucky Nanny to Mommy reader the opportunity to win a Satin Trim Cotton Sleep Bra by Nursing Bra Express™ and Molded Seamless Washable Nursing Pads by Baby Nip™, total retail value $33.50. This giveaway is sponsored by Nursing Bra Express. "Our very own nursing sleep bra will give you the comfort you need for nighttime feedings or while at home with baby. Wear during maternity too, when your breasts may need light support while sleeping or lounging. Our Satin Trim Cotton Sleep Bra has soft elastic, criss-crossed styling that allows the breast to come out by pulling the fabric outside the breast, which is a "pull aside" for nursing access. A sleep nursing bra is made for ease and comfort, no fussing with drop down clips for middle of the night feedings. Sleep bras are also made to hold nursing pads in place at nighttime. No padding, no underwire. 58% polyester/32% cotton/10% spandex. Imported. By Nursing Bra Express™." "Seamless, contoured, washable nursing pads that fit perfectly in your bra! Leaks happen, be prepared with Washable Nursing Pads by Baby Nip™. Leaks are especially common during your 3rd trimester when your breasts may leak colostrum and during the first 2 months of nursing when your breasts are adjusting to your milk supply. High quality, soft cotton pads are reusable and the environmentally friendly choice among nursing moms. Molded shape provides good fit and positioning in your bra. Seamless shell doesn't show through clothing. Multi-layered for absorbency. Outer layer is 100% soft cotton. Change pads when wet, wash with like colors in warm cycle, tumble dry or lay to dry. 95% cotton/5% polyester. Made in Canada. Come in 6-count package." I reviewed a Molded Cotton Nursing Bra by QT Intimates from NursingBraExpress.com back in July of last year. They were great to work with and shipping was very fast. Check out the REVIEW. 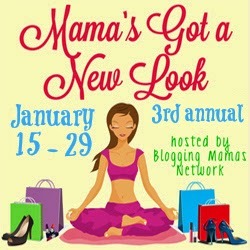 So Easy Being Green, Viva Veltoro, the Blogging Mamas Network, and the Mama's Got a New Look participating bloggers are not responsible for sponsors who do not fulfill prize obligations. This contest will run through January 29, 2015 at 8:59 pm PST (11:59 pm EST). Winners are chosen via Random.org, ALL winning entries ARE verified. The winner will be notified by email they signed up with and will have 48 hours to reply or another winner will be chosen. No purchase necessary. US entries only. Must be 18 years or older to win. The sponsors provided me with free samples of these products to review, and I was under no obligation to review them if I so chose. Nor was I under any obligation to write a positive review or sponsor a product giveaway in return for the free product. This promotion is in no way sponsored, endorsed or administered by, or associated with, Facebook. We have represented each sponsor with the expectation they will fulfill their prize and in a timely manner. We will contact the sponsor regarding your prize. The sponsors, in most cases, are shipping their items to you directly. I will make every effort to assist you in obtaining your prize. If there is an issue with a sponsor, please notify Nanny to Mommy at Diana.n.chastain@gmail.com within 4-6 weeks for assistance, after that we may be unable to assist you. I like that there are lots of great tips for breastfeeding and support. I would love to have the nursing tanks. First of all I like that all of their bras go up to larger cup sizes, and that they carry Earth Mama Angel Baby Organic Milkmaid Tea, which is an excellent product. I would love to have the nursing tanks. I would like to have the Essential Embrace™ Nursing Bra by Bravado for my daughter who is expecting in June.